Over the past few years, we at New Covenant have added to our theological vocabulary the word Christocracy. 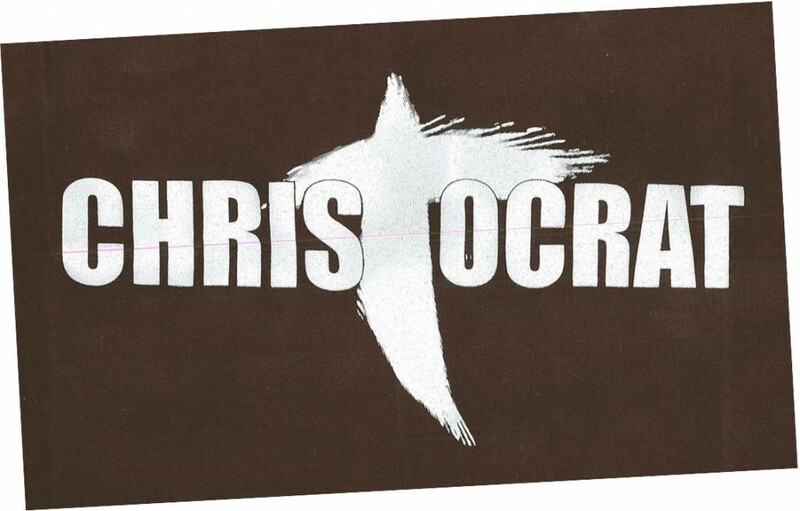 We confess that we are Christocrats. Since these terms are unfamiliar to many people, we want to define and instruct ourselves in the subject so that we can be able to explain it to others and appreciate the revelation. This is important because language and use of words are a gift that God has given to mankind. If you understand the word, you will use it effectively to build yourself up in the light of the total revelation of God. Therefore, Christocracy means Christ's government on earth, and a Christocrat is a representative of Christ's government. Can you break down the concept of Christocracy a bit more? We must understand that Jesus came specifically to set up God’s kingdom on earth. Or we can put it this way: Christ came to establish a permanent kingdom that replaces the temporary kingdom that Satan took over from Adam in Genesis 3. Read Genesis 3:15 and please note that the phrase “the seed of the woman” refers to Jesus. Also read Mathew 2:1-6. Jesus was born a King but He would have to come and set up a kingdom. The fears of the kings who lived during Jesus' time were genuine, but Jesus was not coming to take over their kingdoms (John 18:36). Instead, Jesus came to set up the kingdom of God. What is the kingdom of God? Simply put, it is submission to God's rightful rule and authority over every thing and person because He created everything. The Bible tells us what this kingdom should look like by explaining God's laws and expectations for our behavior. That is why He instructed His disciples (and us as modern-day believers) to pray for His Kingdom to come on earth as it is in heaven (Matthew 6:10). But the role of the believer is not only to pray for God to set up His kingdom on earth. We are charged with establishing His Kingdom by exercising the dominion given to us in Genesis 1:28 and using the keys to the Kingdom of Heaven given to us in Matthew 16:19. In doing so, we govern the earth for God's glory until His expected and imminent return. You pointed out a couple of scriptures, but not one mentions the words Christocracy or Christocrat. Is this doctrine really Biblical? Many words embraced by the modern-day church are not specifically used in the Bible. For instance, you'll never find the words "rapture" or "homosexuality" in the original text of the Bible, but the Bible unquestionably discusses and takes a position on both concepts. Take a look at 1 Thessalonians 4:13-18 for an example of the Bible's views of the rapture, and examine Romans 1:26-27 for a Biblical perspective of homosexuality. "Rapture" and "homosexuality" are not Biblical words, but these words have been used over time as a short-hand to refer to certain principles discussed in the Bible. Since language constantly changes with the progression of time, the purpose of using a new word to describe well-established principles is to make things easier to understand. The Biblical principles of Christ's divine rulership and our role in representing Him on earth are clearly identified in scripture. 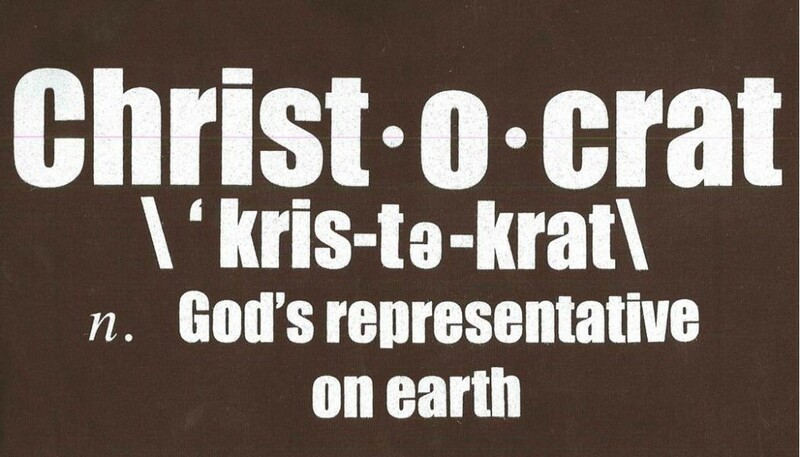 The words "Christocracy" and "Christocrat" are just a short-hand for these principles. Do Christocrats only believe in serving Jesus Christ? What role do God the Father and God the Holy Ghost play in Christocracy? Christocracy embraces fully the concept of the Godhead identified in scripture, consisting of God the Father, God the Son (Jesus Christ), and God the Holy Spirit. The focus on Christ in Christocracy serves two purposes. First, it is consistent with the Bible's teachings that the Godhead would establish its Kingdom on earth through Jesus Christ and those redeemed by His sacrifice on the cross. (Isaiah 9:6-7; Revelation 5:9-10). Second, it makes Jesus a central figure to remove any confusion about whose kingdom we are advancing. Using a general term like "theocracy" does not accomplish this because the root of the Greek word "theo" refers to god (but not necessarily the God of the Bible). Okay, but how do I practice Christocracy? Like Jesus, we do not speak of "governing" in the traditional sense of holding political office. While it is possible for a Christocrat to be a politician or a government employee, being a Christocrat simply means that we use the gifts, skills, knowledge, and resources that God has given us to represent Christ within our respective spheres of influence. Remember, we defined the kingdom of God as a system reflecting total submission to God's authority and rulership. This touches every area of life--from our salvation, to our health, to our finances, to our environment, to our political structures, to our food systems, to our methods of helping others in need, and on and on. If you can think of any issue in life, be assured that the Bible has expressed a view on it. And following the Bible's view on an issue is practicing Christocracy. By doing so, you are bringing the kingdom of God closer to earth since you are submitting to His authority and rulership. So as Christocrats, we aim to be like the two servants in Matthew 25's parable of the talents who were honored for using what they were given to create a profit for their master. If God has given you a passion and skill to work with children, then you can practice Christocracy by being a Sunday school teacher or a teacher in a Christian school. If God has given you an artistic sense of style and a flare for design, then you can practice Christocracy by designing stylish clothes that reflect Biblical modesty. If God has given you a desire to help others in physical pain or distress, then you can practice Christocracy by entering the medical field. Whatever you do, work at it with all your heart as working for the Lord, not for human masters, since you know that you will receive an inheritance from the Lord as a reward. It is the Lord Christ you are serving. Tell us how you will get involved and how we can reach you. How will you commit to practice Christocracy? Through church administration, evangelism, mission work, etc. New Covenant Christian Ministries is an ambassadorial ministry representing the Kingdom of Jesus Christ here on earth.